I have been working on a project. Slowly but surely, over the past few months I have been collecting things that have meant a lot to us during this season. Prints people have given to us, pictures of sweet Gideon, things to remind us of what God has done. Things to remind us of our baby. God sent me someone to help me capture the beauty of it all. I mentioned her a couple weeks ago, but I have a very dear friend. This wonderful, beautiful, and talented friend challenges me to take risks. To not worry what people think, but instead to care about what is meaningful to me. I looked to my inner Myquillyn Smith, planted her mantra firmly on my brain, and set out to do a gallery wall in my home. “It doesn’t have to be perfect to be beautiful…” I’ve run her saying over and over again in my mind the past few years, and it has always meant a lot to me, but as I stood with her hanging pictures on the wall of baby Gideon its meaning came alive. Myquillyn is so fun to watch work. She is so good at what she does and I learned a ton. See that sticky note? That was our very official measuring device. Also, in case you were wondering, when hanging a gallery wall the first piece is the hardest. Once the first piece us up the rest fit in around it. I was walking into Homegoods last week for one final frame I needed to make our gallery wall complete. As I walked in I had this calming sense that God was going to bless me in that place. What I found greatly surprised me. It was a huge disco ballish, mutli-colored, and flashy PEACE. Surely I was looking for something to represent PEACE on my wall…but this? Its kind of, well, ironic at best. But there is no way I could leave that store without it. Never in my life have I seen anything like it and it was the only one of its kind in the store. So out I went. With my loud, boisterous, and glittering piece of PEACE. Myquillyn hit the nail on the head as she gracefully hung it on my wall. She said, “You know, it represents the kind of PEACE that is in your home.” That’s it isn’t it?! God’s Peace, His perfect Peace, His real Peace…its often in the wake of the most difficult times in life. True Peace came when we needed it most. True Peace came when nothing looked peaceful. It came when you looked at ours lives, at all that was happening and thought “truly how can this be? Where is the good? Surely there can be no peace here.” But there it was. In the middle of our pain, in the middle of our loud, in the middle of our messy, in the middle of our inadequacy there it is. God’s perfectly imperfect PEACE. This “E” and the “C” were originally multi-colored. I told Myquillyn I would love it so much more if they were blue. To which she said, “Let’s paint them!” Of course! This is why she is a genius. Square by square we painted that bad boy in all different shades of Gideon Blues. I am not an interior designer. I don’t feel very artistic. Part of me wonders if I am color blind I am so bad at matching things. But my home is not about those things. I am so thankful for the gift and the calling Myquillyn has. To show women, to remind them that it is not only about making things look perfect, tidy, and put together on the outside. 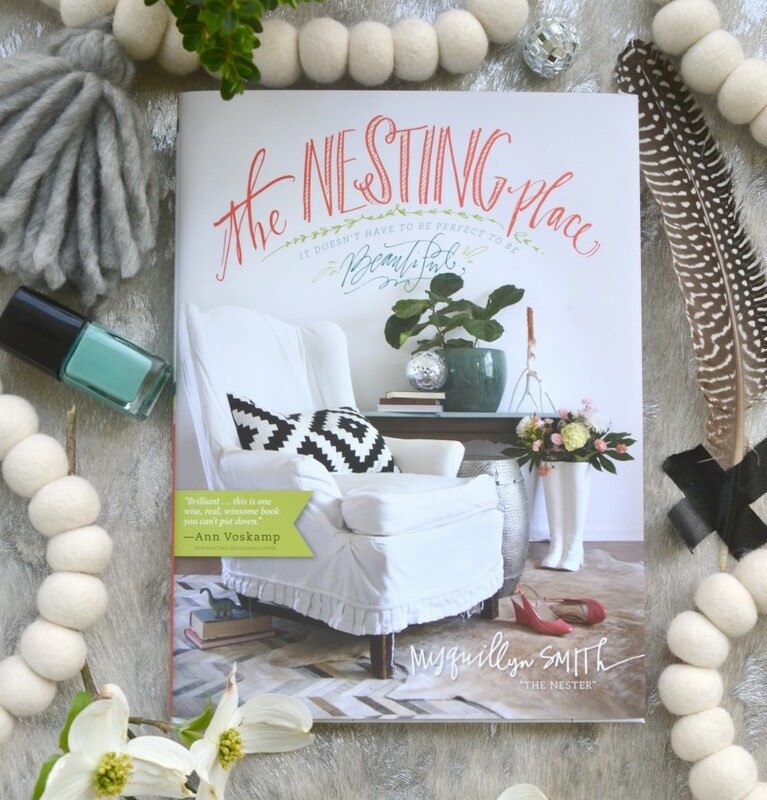 Myquillyn writes in her book “The goal for our home is to be a place to connect with others, foster rest, inspire, and to be a welcoming place to come back to.” Thank you dear friend, for teaching that so gracefully. Here is her masterpiece. It is literally the most beautiful book I have ever laid my eyes on. Click on the picture to read all about it. And for me, for our home? May we connect with people in our home remembering that relationships in this life are the only thing we get to take with us to Heaven. May we find rest in each day, soaking in what every moment holds. May we inspire people to embrace and to find God’s perfectly imperfect peace. And may those whom we love come back over and over and over. So as I sat there admiring our PEACE wall, I prayed. I prayed purpose and blessing over our home. I prayed for what that wall represents, for what it means, and for what it might remind people of every time they see it. Here is the finished product. Each and every piece on this wall has a huge story to tell. I pray that you will come over to see it soon! Today I pray for you too. May you find hope and joy in God’s perfectly imperfect peace. Maria…..you always capture me with every word you write. It’s amazing how I feel your every word and how I want to keep reading. Your wall of Peace is magnificent! Each and every piece on there a treasure. I hope one day I can come visit it. You are constantly in my heart. A day doesn’t go by without a thought of you and your family in it. With love and hugs Laura McCarthy. I hope one day you can come visit too! Your continued love and encouragement is such a gift Laura. Your gallery wall is beautiful! I love that Myquillyn helped you~I adore her book and I love that you are friends! I received my magnet of your sweet boy last week and it’s hanging on my imperfect chalkboard, reminding me of God’s ability to teach us during really terrible times and to bring His peace. Sending hugs and wishing I lived close enough to pop over! Oh I am so glad you got it! It’s such a gift to see who God brings together, thank you for walking this journey with me. I wish you were close enough to pop over too!